New Holland and Asiatic Isles. This a wonderful example of John Thompson's 1814 Map of Australia, New Zealand, New Guinea and parts of Polynesia. Extends from Western Australia and the Celebes eastward as far as New Caledonia and the Fiji Islands. Extends southward as far as New Zealand and Chatham Island. Notes the discoveries of important explorers in the region including Captain Grant, Captain Bandin, Captain Cook, Captain Flinders, Captain Bass, Captain Dampier, and others. Make notes on terrain, soil, water sources, and safe ports. 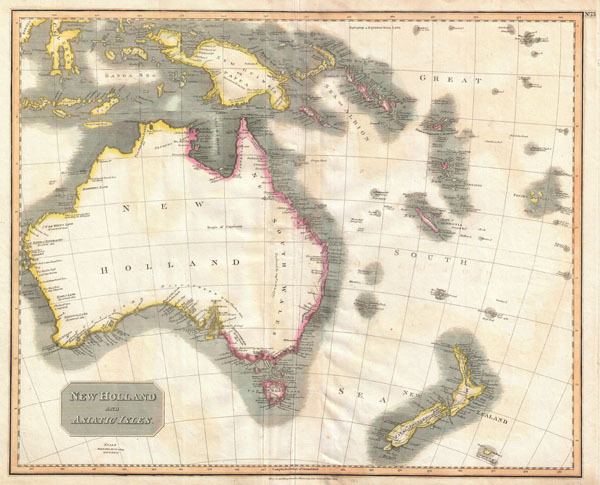 This map was prepared around the same time that Captain Flinders published the first accurate map of the Australian coast. Slightly crisper impression in the south eastern portions of Australia, suggests several updates based upon Flinders' work. Prepared in 1814 by John Thomson for publication by Baldwin & Cradock as plate no. 73 in the 1817 edition of Thomson's New General Atlas. Good condition. Minor creasing on and near the original centerfold. A couple of minor verso repairs to margins. Rumsey 1007.079. Tooley, R.V., Mapping of Australia and Antarctica, p. 156, 1256. Phillips (Atlases) 731. Newberry Library: Ayer +135 T4 1817. National Library of Australia, MAP F 848.